Purfex many decades ago at the rented premises on 29 St Benedicts Street, Auckland. In 1970, according to the rent book, rent was only $32 per month! In 1939, Austin Purdy, the founder of Purfex Display Models Ltd, started his business in a workshop under his parent’s high-blocked home in Mt. Eden. Austin Purdy began by repairing plaster shop mannequins popularly used by New Zealand retail fashion establishments during the 1920s and 1930s. As mannequins such as these were expensive to purchase and very fragile, Purdy’s initiative likely found a ready clientele in an economically stressed retail market still suffering the effects of the depression and about to encounter wartime austerity measures. It is not known when Purdy began to manufacture his own mannequins, but an advertisement placed in the Auckland Star in January 1945 for a “boy to learn display model manufacture, papier mâché and plaster modelling” suggests that it was around this date. 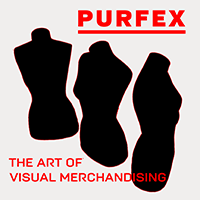 It is likely that Purfex’s manufacturing of mannequins in the immediate post-war period was in response to the growth in apparel manufacturing and retailing in New Zealand. From 1947, many local apparel retailers were eager to embrace the completely new fashionable styles influenced by Christian Dior’s ‘Corolle’ line, known popularly as the ‘new look’. New fashions demand new styles of mannequins. This is particularly so for ‘new look’ fashions with there narrow rounded shoulder-lines, nipped-in waists, and accentuated hip lines: a completely different silhouette from that of pre-war fashion. 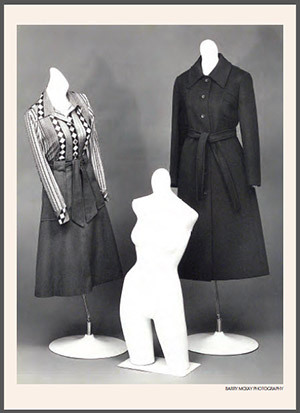 A 1949 report on the “Conditions, influences and trends of merchandising and display in New Zealand” in the immediate post World War Two period by C. H.Andrews notes the interest expressed by retailers in special mannequins designed and made in New Zealand specifically for the display of New Look garments. 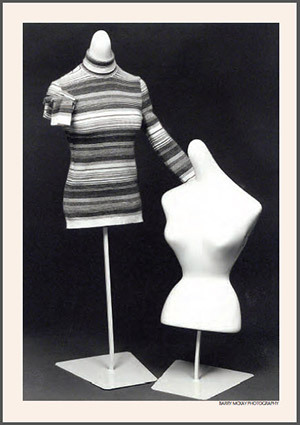 Indeed, the archive of historic mannequins collected by Glen Wilkin-Holland overthe past decades includes a ‘new look’ mannequin made by Purfex for Auckland department store Smith & Caughey. By 1958, when Austin Purdy legally incorporated Purfex Display Models Ltd asa private company, the firm had diversified its production from the expected“display forms, dress makers models and all other types of models” to include,surprisingly, the manufacture of “fibre glass boats and reinforced plastic fabrications” and “furniture…in all its branches”. It seems too that the company also manufactured, imported and wholesaled “fibrous substances of all kinds” while retailing “textile fabrics of all kinds…household and commercial fittings and utensils and ornaments.” A 1960s advertising flyer in the Purfex archive for decorative door mouldings and panels illustrates the continued pursuit of a diverse product range. However, as the decades progressed the balance of production shifted back to mannequins. When a young “serially unemployed” Glen Wilkin-Holland was sent to Purfex by the Labour Department in 1977, Austin Purdy, who still headed the company, was willing to give him a chance.Over the next decade the ambitious Wilkin-Holland tried his hand at most aspects of the factory, an experience that he values as having provided him with “a really good grounding in how to make mannequins from scratch.” Working his way up from the sanding benches to factory manager, Wilkin-Holland had the opportunity to purchase the company when it fell into receivership in 1998. Along with his business and life partner Fraser Moreton, Wilkin-Holland embraced the opportunity to continue Austin Purdy’s legacy of producing high quality locally made display mannequins for the New Zealand market. Article written by Angela Lassig – a New Zealand-based fashion historian, curator & writer/author and former specialist museum curator with more than 25 years experience at major museums in Australia and New Zealand. Photographs by Barry McKay Photography.